I found this thing parked in my front yard this morning. The Recreation and Beginner rides will start from Groton Center on Monday of this week. 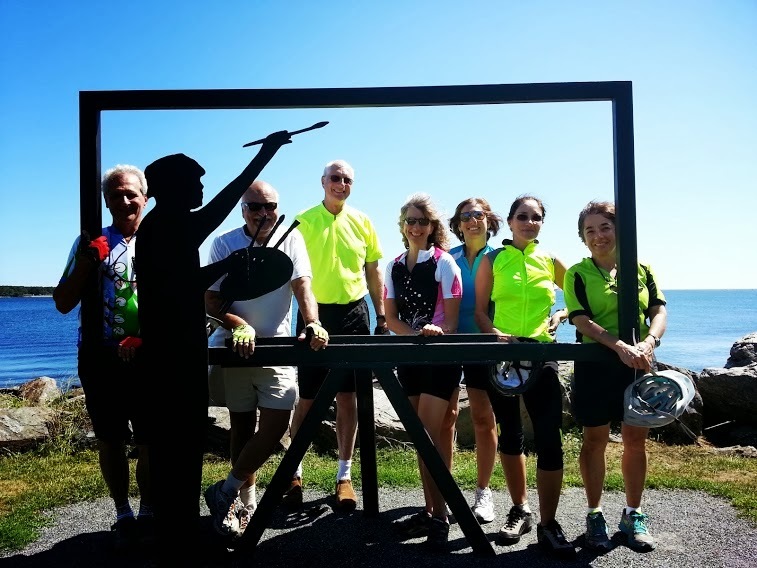 The Recreation Ride will ride a bit of the rail trail before turning west toward the new Fitch's Bridge and riding some scenic backroads on the way to Pepperell and then returning to Groton Center. The Beginner Ride will travel the rail trail to East Pepperell Center and take a small side trip across the covered bridge to the banks of the Nissitissit River. Route Map - Groton - Fitch's - Pepperell. Elevation Gain - 270 feet (easy). Elevation Gain - 160 feet (easy). We can have lunch at Martha's Exchange (a brew pub) in Nashua before heading back. If the weather is nice enough we can have lunch outside on Main Street. Route Map - Pepperell - Nashua - Martha's. What can I say about tomorrow's weather other than PERFECT. I'm sitting in a bar in Cambridge waiting for my son to get out of class, so I don't have access to a computer. Here is the link to the starting point in Lunenburg. For complete information, refer to Sunday's email. I'm running out of superlatives for the weather we have been having lately. How does SUNNY mid 50s when we leave and SUNNY and mid 60s when we return sound? It's not supposed to be as windy as Monday either with just a light breeze from the North. Lunch will be at Marcus P's Diner Plus in Greenville. AR Index = Roughly 37 flat, smooth miles. The weather this week looks truly delightful! We better take advantage of it while we can since November is coming. The Monday rides will start in Chelmsford Center and ride the Bruce Freeman Rail Trail toward Carlisle and Great Brook Farm State Park or the Cranberry Bog. On Monday, September 23rd - Chelmsford Center. We will ride to Whalom Lake, then DOWN (mostly) to Lake Shirley. Then it's back UP to the alpacas and Hickory Hills Lake. From there it is UP to Bayberry Hill before zooming down to Pearl Hill State Park. Then it's smooth sailing on new asphalt for about 4 miles. 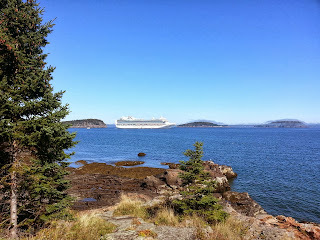 After a final UP to the golf course we will cruise back to Lunenburg Center. It is my very sad duty to report that there was a very serious accident on the Sea Coast Century ride today. A car veered across the center line and hit a group of bicyclists killing 2 of them and injuring 3 others. The only possible consolation is that Donna and I were miles away when this occurred. We finished the 100 miles in 6:52 with an average speed of 14.4 MPH. We didn't find out about the accident until after we finished, so at least we had a good ride and were elated that we completed 100 miles. While the bicyclists involved apparently did nothing wrong, its still a good time to remind AdventuRiders that bicycles ALWAYS lose to cars and trucks! So please take a few minutes to read our Safety Reminders with more seriousness because the last thing we want is an injured rider. I will be stressing the more important rules on upcoming rides. Sorry to be the bearer of bad news, but let's at least learn from it. Saturday looks like very nice weather for a Century. It should be partly cloudy and mid 50s when we leave, and mostly sunny and low 70s when we return. There could be a cross wind sea breeze on the way back, but I know an inland detour if necessary. So I have two plans. They both leave from Hampton Beach (ride headquarters) and follow the official route to Cape Neddick in York, ME. If I'm running out of steam at that point, I have a route back that will give us a metric century. If I'm still raring to go, I have a route that goes up to the beaches in Wells, ME and then inland to the Eastern Trail and back to Kittery to rejoin the official route to get a full century. Of course there is always the 25, 50, 62, and 100 mile official routes if anybody wants to join us. I plan to be in the registration line at 7:00 AM. Route Map - Metric Century. Route Map - 100 real, all-American, miles! Equipment - A bike with road tires is HIGHLY recommended. AR Index = Roughly 66 or 104 flat, smooth miles. RSVP if you plan to join me. How many TOP 10 days do you get? Tomorrow looks like it will be another one with temps in the low 60s when we leave and low 70s when we return all under bright blue skies! We will start in Groton Center, ride past Baddacook Pond, Massapoag Pond on our way to the Stone Arch Bridge in Dunstable. There are great mountain views from the ridge in Dunstable and beautiful farms and conservation land along the way. The last couple of Fitness Rides have been pretty strenuous, but I am winding down a bit so I can do the SeaCoast Century on Saturday. It's still 24 miles and 450 feet elevation gain, but I plan to take it a bit easier tomorrow. Route Map - Groton - Stone Arch Bridge Dunstable. AR Index - Roughly equal to 27 flat, smooth miles. LUNCH - Filho's Cucina in Groton. The weather is looking terrific tomorrow! It should be around 60 degrees and Sunny when we leave and near 70 degrees and still Sunny when we return. It may cost $10 to park at Stage Fort Park. If you want to carpool let me know and I will try to arrange something. Lunch will be at Bearskin Neck in Rockport. There are multiple restaurants and we can have a picnic at the end of the neck. The weather is looking like a TOP 10 Day at this point! 10:00 AM - We will leave. 2:30 PM - We should be back to Stage Fort Park. Equipment - I will be riding my ROAD bike. AR Index - roughly equal to 30 flat, paved miles. If you are not planning to do the Granite State Wheelmen's 40th Annual SeaCoast Century, featuring the new lifting bridge at Portsmouth, NH (Whew! ), you can ignore the rest. I've lost track of who has signed up, so if you want to coordinate with me, RSVP. Thanks for noticing that Bill S.
The weather isn't looking picture perfect tomorrow, so I changed the starting point to Chelmsford Center so we could have a dry lunch anyway. The "Few Showers" forecast is often wrong. The rest of the forecast shows low 60s in the morning and mid 60s in the afternoon. On Monday, September 16th - Chelmsford Center. We will ride to the Stone Arch Bridge in Dunstable. Stay tuned for more details. Its not too far and not to hilly, so I should be in good shape for the Seacoast Century on Saturday and/or Sunday. Well, the weather is looking much better for tomorrow. It should be mostly cloudy and mid 60s when we leave and partly cloudy and around 70 when we return. It should be a tail wind on the way back. On Friday, September 13 - Lake Potanipo, Brookline, NH. 1:00 PM - Non-lunching people should be back. It's hard to believe that it's supposed to be 95 degrees, sunny and humid tomorrow. Of course that means WET RIDE since the original plan was much too dry. We will meet at Forge Pond in Westford, the same place we met on Monday. The hourly forecast calls for a "feels like" temperature of mid 80s by 9:30, so we may want to start off with a swim in Forge Pond. From there, I'm thinking we could go to the newly weed free Sargisson Beach, then the always beautiful Burges's Pond and possibly Nabnasset Pond too. As the "feels like" temperature nears 100 at 1:00 PM. We will figure out lunch somewhere. AR Index - Roughly 24 flat, smooth miles. Bring a coat, it's chilly. Monday looks like another top 10 day! It should be mid 50s when the morning ride leaves and near 70 when we get back from the afternoon ride. Sunny skies, low humidity, and light breezes complete the picture. As a reminder, you MUST have an approved bicycle helmet, and you MUST pump up your tires! You will also need to initial and sign our Release and Waiver of Liability. Route Map - Westford - Cow Pond. AR Index = Roughly 16 flat, paved miles. 11:30 AM - LUNCH Pizzeria Presti. We can have a picnic at the beach. 12:30 PM - the Afternoon Beginner Ride will leave. Route Map - Westford - Nabnasset - Stone Arch. AR Index = Roughly 14 flat, paved miles. On Friday, September 13th - Lake Potanipo, Brookline, NH. I thought we had great weather on our Wednesday seacoast ride! But on Friday ... How does low 50s when we leave (bring a coat) and low 60s when we return, all under bright blue SUNNY skies and light breezes sound? Lunch will be at The Angler in Westminster. I'm told the fish is fresh and very tasty and I've found the Grilled Black Angus Burger to be good as well, especially with the sweet potato fries. BTW, to get to the starting point, get off Route 2 (exit 25) and take Route 2A into Westminster. When you see the red "Westminster Cracker" building, turn sharp left just BEFORE the building and drive up the hill to the gazebo. Oh, and the last time I checked there was a PortaPotty and it was unlocked. Don't worry about registering yet, some of the Recreation Departments haven't got their Fall schedules posted yet. Get ready for a gorgeous ride around Mount Wachusett. It's a bit outside our 30 minute starting point radius around Groton, but Route 2 is pretty quick. There are a couple of Category 5 hills on the ride, but we've never really noticed the first one and the second is reasonably short (and there is no shame in walking). Did you catch the beautiful sunset, blue sky, and cool dry breeze tonight? Tomorrow should be beautiful! So I've had a lot of interest in carpooling, let's meet at the Shaw's parking lot in Groton at 119 and 225. We need to LEAVE at 8:45, so let's meet at 8:30 AM and we can divvy up bikes, riders, and drivers. Route Map - Hampton - Portsmouth - Kittery. 12:30 PM - LUNCH at Portsmouth Brewery. 3:00 PM - We will be back to Hampton North Beach. If you believe the forecast, it should be SUNNY and near 70 degrees with low humidity when we leave for our seacoast ride from Hampton North Beach to Portsmouth (and Kittery, ME) on Wednesday. It should be near 80 and Sunny on the way back with a slight sea breeze headwind on the way back! In addition to our normal spectacular ocean view ride, I have added a short loop to Kittery, ME to try out the new Memorial Bridge. This is a somewhat different ride that the usual Westminster ride. New places to explore!